Our friends at Samsung have just let us know that the Canadian Galaxy Notes are going to be receiving a software upgrade pack that includes a suite multimedia apps and S Pen optimized apps in conjunction with ICS. The rollout of the software is supposed to start tomorrow. Check out the full press release after the break. MISSISSAUGA, July 12, 2012 – Samsung Canada today announced that the Premium Suite upgrade for GALAXY Note users will be available starting tomorrow. 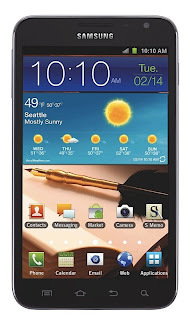 It includes extra multimedia features and a range of new S Pen optimized applications in addition to an OS upgrade to Android 4.0 Ice Cream Sandwich. The Premium Suite offers new features and applications exclusive to GALAXY Note and its innovative S Pen, which includes the option to download the free app, S Note, a unique tool that lets you combine your notes or sketches with other digital content, giving you a new way to create your own stories. S Note comes in various ready-to-use templates for a range of tasks including meeting minutes, diary and others. S Note also includes the innovative Shape Match and Formula Match applications that help correct and digitize geometric shapes and even solve mathematical formulas hand-drawn with S Pen, increasing your on-the-go efficiency and productivity. You can draw tables and grids which are instantly digitized, saving time and effort. Moreover, by using the S Note’s integrated knowledge search engine, Wolfram Alpha, users can quickly search, and obtain information by simply writing out a question. For a touch of self-expression, the Premium Suite also includes My Story (which is a download from S Choice), another S Pen optimized application that allows you to create personalized digital cards for friends or family using any type of content including notes, video content, photos, text or voice. The Ice Cream Sandwich upgrade brings a new user experience to Android on GALAXY Note, with a more intuitive user interface that includes a redesigned App menu for easier multi-tasking. The upgrade also introduces innovations such as Face Unlock, Data Usage, Android Beam and others. The Premium Suite upgrade for GALAXY Note users will be available from Canadian carriers tomorrow. For specific details, please contact your local carrier.